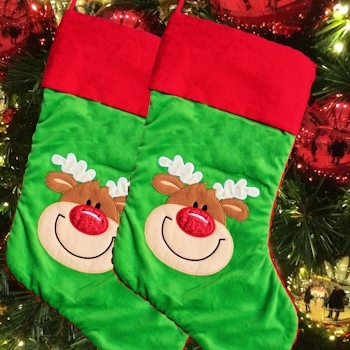 Rudolph Christmas stocking in red and green. Soft green velour with a decorative red scalloped bias edging, red faux satin cuff with durable hanging loop. Soft green velour with a decorative red scalloped bias edging, red faux satin cuff with durable hanging loop. Quality stocking that is fully lined inside and padded. Applique embroidered Rudolph the red nosed reindeer on the front. Generous size opening to make it easy for Santa to leave those extra special gifts. 25cm top width and 53cm diagonal length.